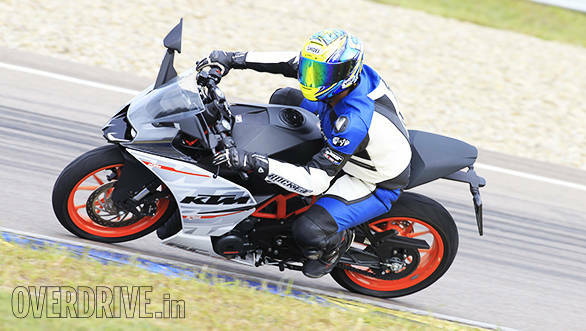 We take KTM's RC 390 out on a racetrack. Here is what we learnt from that. I have in the past found it very hard to explain to people that there is a subtle difference between a versatile streetbike - they make great keeper bikes - and a focussed streetbike - they're emotionally delicious, very rewarding to ride but hate many things versatile streetbikes will do easily. But now the RC 390 will make this easier to explain. Because the RC 390 is a sportsbike. And when KTM bills it as a sportsbike they're not messing around. There's no fooling around with that we need less committed ergonomics because the segment is full of new riders all over the world. If it's going to be a streetbike then it will have a fairing, it will be amazing in corners and there'd better be power. The rest is just the stuff that fills out the rest of the picture. 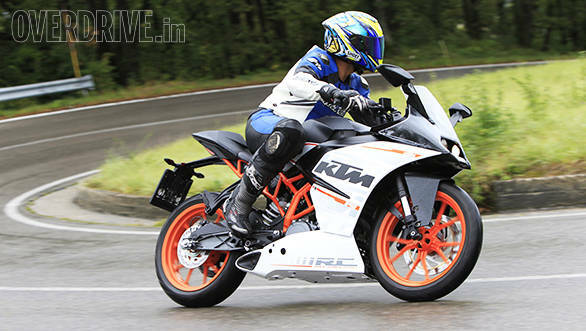 The RC 390 in many ways to me is a grown up Yamaha R15 in nature. I mean that in the most positive, complimentary sense possible - allow me to explain. One of the things we loved about the R15 was that it brought together a forgiving chassis, a reasonably powerful engine and a clear sense of purpose. As we found at our umpteen track outings on the Yamaha, this was a very good combination of abilities when you think of India as a nation of young riders where a small (but growing) percentage is beginning to become serious about riding and spending time and effort learning how to do this better. The R15 is perfect for this. But eventually, you realise that you need something faster, something more tasty because the R15 is many things, but it is also a 150cc bike. Eventually 17PS becomes not enough and the craving for more sets in. Especially after you get used to it. The RC 390 then is the perfect upgrade to R15 riders as well as a stunningly attractive prospect for serious riders who are trying to learn the art of fast riding. It does this in many ways. First, the engine is a peach. There are no serious changes from the Duke 390 to the RC though some details like the intake path have had alterations to fit the new styling. Which means there is always abundant torque and power and you'll never run out of it. It is also a terrific amount of power for a lightweight motorcycle that happens to be really affordable as well (price officially comes on September 9, we are expecting around Rs 25,000 over the 390 Duke). So it will hit 170-odd kmph without fuss or waiting. At the relatively compact Modena circuit, I easily saw 171kmph before braking into turn one. That's not slow. And acceleration similarly is thrilling as well. The chassis - if you consider the 390 Duke as base - has to undergo changes. The minor one is that the subframe kicks up higher and you can see this because a large chunk of the subframe is clearly visible. The major one is that the steering angle has been steepened by 1.5 degrees, from 65 degrees on the Duke to the 66.5 degrees on the RC. That one change brings lots of changes. First, a sharper steering angle means the motorcycle responds quicker to your inputs. But it also brings trail down, which means the motorcycle will want to turn with less effort. And it also leads to a shortening of the wheelbase by 27mm, which is not an insignificant amount. Add to this that the swingarm is exactly the same and you have on your hands a noticeably sharper motorcycle. KTM further points out that when you bring the front wheel closer to the centre of the motorcycle, it also raises the ride height by a small amount along with an attendant rise in the centre of gravity. A higher centre of gravity makes motorcycles more flickable. The flip side is that all this agility boosting can see the flip side of agility, instability rears its unsettling head. But it all adds up. The RC 390 is extremely happy to change direction and turn in is effortless. Modena's race track has at least four places in its 2km layout where you're flipping the bike from full lean on one side to full lean on the other. Even these transitions prove smooth and there is a real danger that you'll end up using muscle and unsettle the bike before calming down and realising that you're overriding the machine. Then you will notice the mid-corner stability and the Metzeler M5s are praiseworthy in how well they work with the KTM chassis. If you like cornering, you'll love the RC. Supersport bikes sacrifice everything at the altar of performance. That's their nature. And despite being the wee machine it is (relatively speaking), the KTM is vastly more focussed than other bikes including the Honda CBR250R/300R, Ninja 300 etc. That is how it manages this kind of calm but extremely effective chassis and engine performance. But in the same breadth, the clip-ons are placed for aerodynamics, feel and control, not comfort. Riding on city streets, you'll have to learn to live with the position. It isn't so extreme that you'll find it unrideable, but it is - if memory serves - one of the most committed ergonomics packages I've seen in Indian motorcycles. What I really liked about the RC was that (just like the R15, and I think unlike the Duke) the RC is calm of temperament. Which means when you're hyperventilating trying to go faster, the motorcycle isn't adding to the frantic mess, it's the gentle hand that tells you to calm down to go faster. Even more likeable is the fact that the KTM allows you make mistakes and then recover, learn and carry on. The Modena circuit is pretty technical and my first few laps were full of strange lines and mid-corner throttle and steering corrections. The motorcycle took no notice of these and even after I upped the pace significantly, being off line and then pulling the bike back into the desired place in a corner took no effort or stress at all. Lovely, really. I'm almost ready to see if someone in OVERDRIVE and/or Indimotard will spring for half the cost of an RC which we can then park at Indimotard for track use during our TWO school and track days. Finally, a word of advice. The RC 390 is a stunning creation though I suspect the 390 Duke is still a better motorcycle for our usual riding cycle. I would wholeheartedly recommend you get one but I am not right now only because I don't know the price - it's a matter of days now before that arrives too. But if you do buy an RC 390, do yourself a favour. Before you spend your extra cash on doo-dads and loud exhausts, spend the money on getting to a racetrack instead. The RC will open your eyes to a whole new world of riding. 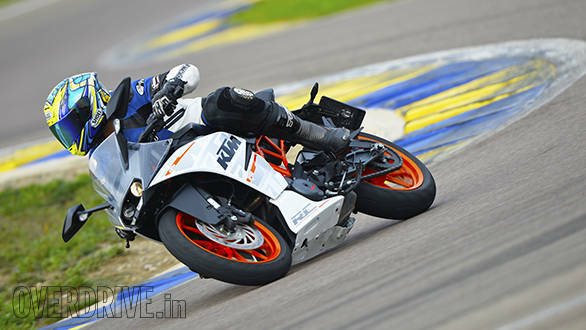 Shumi has also ridden the KTM RC 390's lesser powered sibling, the RC 200. Click here for the first ride review. 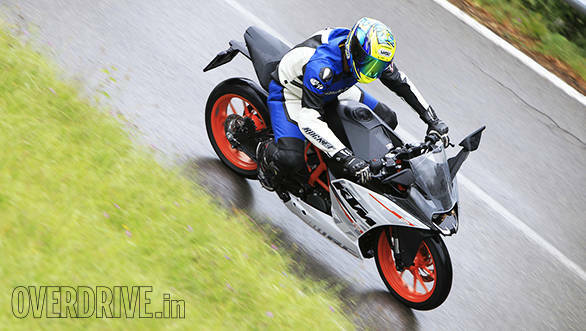 Should you buy the KTM 390 Duke or wait for the RC390?